In unreleased documentary video, top White House Adviser Bannon describes Jews as enabling jihad. 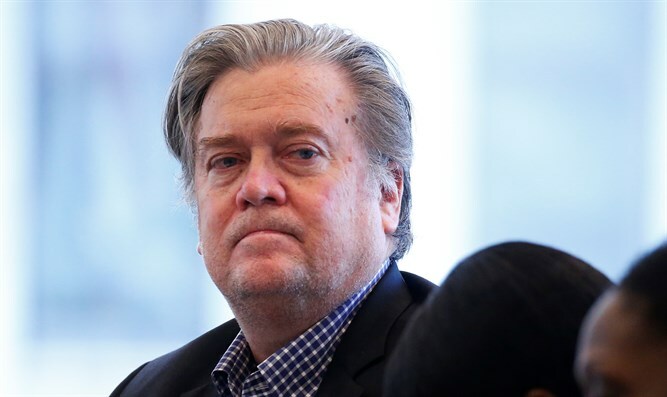 In a treatment describing a documentary on a purported Muslim plan to take over America, Stephen Bannon, now US President Donald Trump’s top strategic adviser, described the "American Jewish community" as among unwitting "enablers" of jihad. Bannon, a former banker who transitioned into a career as a nationalist propagandist, culminating in his becoming a top adviser to the Trump campaign, made several right-wing documentaries in the 2000's. The Washington Post reported Friday on a 2007 proposal for a documentary that was never made called "The Islamic States of America." It would be comprised of interviews of people who, like Bannon, believe that the threat posed to the West is broader than Islamist extremist terrorists, embracing an array of Muslim advocacy groups. It describes as "enablers among us" – albeit with the "best intentions" - major media outlets, the CIA and FBI, civil liberties groups, "universities and the left" and the "American Jewish Community." It also describes "front groups and disingenuous Muslim Americans who preach reconciliation and dialogue in the open but, behind the scenes, advocate hatred and contempt for the West." Among these named by Bannon as "cultural jihadists" are the Islamic Society of North America, a group that had associations with the Muslim Brotherhood at its founding in the 1960s, but in recent years has worked closely with Jewish groups, including in combating anti-Semitism and raising Holocaust awareness among Muslims. Before joining Trump’s campaign last summer, Bannon helmed Breitbart News, a site that is stridently pro-Israel, but which also has featured white nationalists and which Bannon once described as a platform for the “alt-right,” a loose-knit alliance that includes within it anti-Semites as well as right-wing Jews.